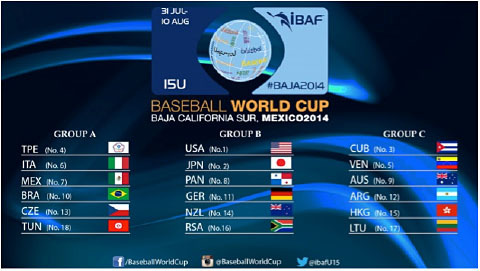 Ten of the top fifteen ranked National Teams in the world will be at the U-15 Baseball World Cup. A total of eighty-three U-15 Baseball World Cup games will be showcased over eleven days and across three newly renovated venues in the cities of Constitución, Los Cabos and La Paz. The opening/closing ceremonies, championship final, and awards presentation will take place in La Paz. U-15 Baseball World Cup action will begin with an initial five match round-robin. The top two finishers from each group, six nations in total, will advance to the four-match second round-robin in La Paz, with head-to-head competitions from the first round carrying over into the next round. The top two finishers escaping the second round in La Paz will play for the U-15 Baseball World Cup gold medal on championship Sunday, while the third- and fourth-place finishers will compete for the bronze medal. The two medal matches will be only contests taking place on the final day. Consolation competitions, which will conclude on the eve of championship final, will be held in Constitución and Los Cabos following the opening round to determine the classification of the seventh- to eighteenth-place countries. Only in its second edition, the U-15 Baseball World Cup platform will potentially challenge what is arguably baseball’s toughest and best represented international competition, the U-18 Baseball World Cup – an event that has featured superstars like Canada’s Brett Lawrie, Japan’s Yu Darvish and Shohei Otani, South Korea’s Shin-soo Choo, Cuba’s Yasiel Puig and Arnoldis Champman, and USA’s Clayton Kershaw, Justin Upton and Buster Posey, among countless others – and which, in 2013, had a potential broadcast reach of 144 million homes and potential online/mobile reach of 20 million. "The WBSC is proud to be at the forefront of youth sport with attractive, successfully established and globally marketable youth engagement platforms like our youth Baseball World Cups and the youth Softball World Championships," said WBSC President Riccardo Fraccari, "and the relatively new U-15 Cup is an integral part of our growth strategy to drive future stars, fans, sponsors, media, broadcasters – and attractive host-cities – to the Baseball World Cups." In addition to a supreme class of National Teams, the 2014 U-15 Baseball World Cup possesses an unprecedented degree of global spread for a baseball event, one that spans Africa (North and South), the Americas (North-, Central- & South America and the Caribbean), Asia, Europe (Baltics, Central- and Southern Europe) and Oceania. It will be the first time either Africa or Oceania has ever been represented in the U-15 Baseball World Cup, and the first time ever that each continent will send two representatives to a baseball world championship – and the U-15 will also mark the historic debuts of New Zealand and Tunisia in a baseball world championship. “The global spread and strength of the countries in the 2014 Under-15 Baseball World Cup will create a truly unique atmosphere and generate great excitement for the athletes, as they come from all around the world to share their talents and admire each other on the international stage -- and shine on it,” Fraccari said. WBSC officials are confident that the eighteen-team 2014 U-15 Baseball World Cup will be an international sporting event that will not only provide a unique entertainment experience for the local residents and visitors, but will also serve as an opportunity to showcase the touristic qualities and culture of Baja California Sur, providing exceptional returns to the host in terms of stimulating economic activity and community development throughout the region. "The 2014 U-15 Baseball World Cup promises not only to be an exciting showcase for the young athletes and fans, but it also has the properties that can deliver a sustainable legacy for the local community," Fraccari expressed.